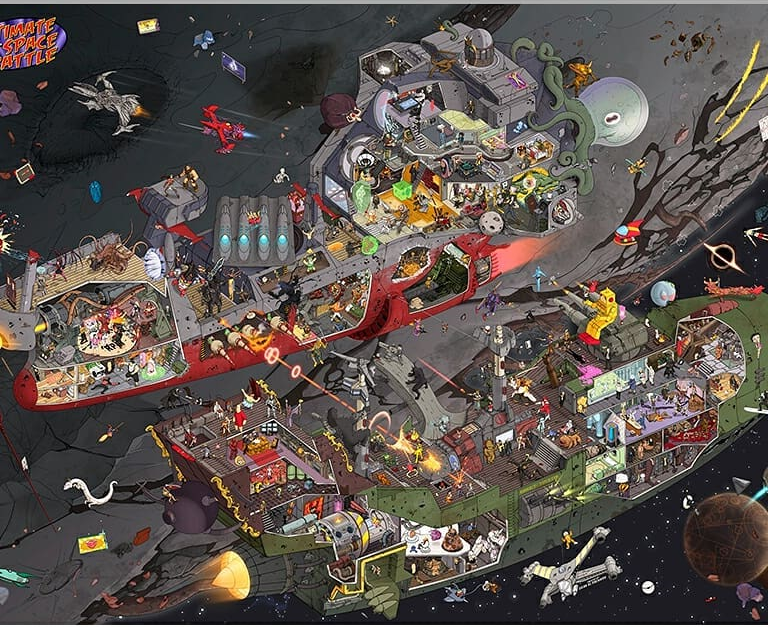 Can we identify all the characters in this “Ultimate Space Battle” poster? Disclosure: I am the creator of this poster. Can we identify which properties they come from and who they are? Some of this information is being obtained from the official chat for this answer. I created a 10x10 grid for this image to help keep track of what is being identified. You can find it by clicking this link, since the image is too large to display properly here. T-Rex skull from Jurassic Park? Front of the Swordfish from "Cowboy Bebop"
number 15 on a spacecraft? Forrest Gump with the Necronomicon in his lap. Avatar Aang, in the form of a Minecraft character, holding the demon blood sword from Adventure Time. Half-section spacesuit, from Planetes, holding what? Kneeling figure with candle/light hat? White eye from Twilight Zone intro? skull with Native American headdress - from Family Guy episode "Petergeist"? White mouse-like creature with a sword under "Brooks was here"
Not the answer you're looking for? Browse other questions tagged character-identification object-identification or ask your own question. 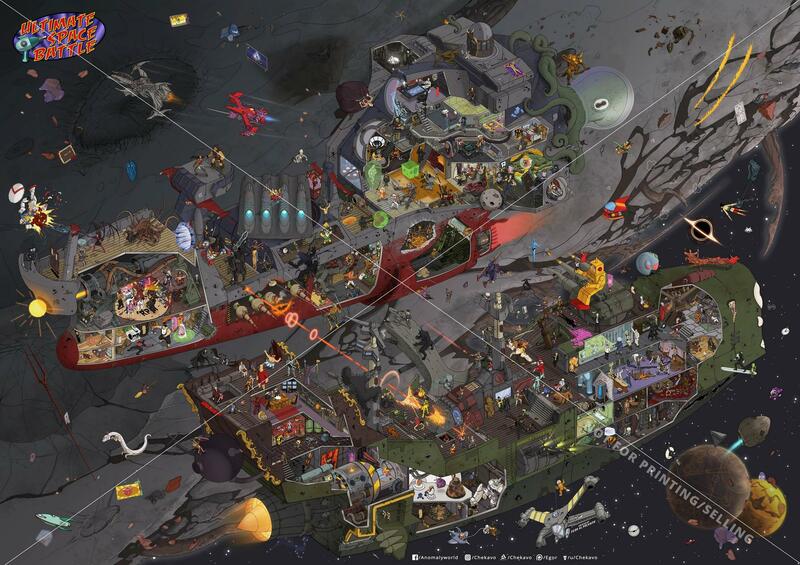 Can we identify all the characters in this Universe 113 poster? Who are the (numerous) patrons of the Warp Core Cafe? Who are these fabric superheroes? Can someone identify all the characters in this Marvel Not Brand Echh panel? What creature has spokes in its eyes, a beak, and strands of hair coming from the very tip of its triangular ears? Who are the characters on this Legend of Zelda poster? What stories and characters are referenced in this painting of a Science Fiction and Fantasy Lounge? Who are these characters on this unofficial New Hope poster? Can you identify each character and spacecraft in this Star Trek TNG 30th anniversary poster? Who are all of these characters/vessels in this next generation era image? Can anyone identify the powered exoskeleton in this image?